I am an old money supply guy. I was trained with a monetarist and watched the number closely in the 80's. Over last to decades, money was not an interesting story. It is still not an interesting story for most. Yes, there is a focus on the Fed balance sheet but not on the aggregates yet they are telling us something. M2 has been declining at some of the fastest rates in 30 years. Some accommodation by the Fed. Retail money funds and small time deposits are shrinking at a fast rate. Savings deposits have increased but money is flowing from the liability side of the bank balance sheet. Banks do not seem to care or they would be raising rates. This suggests that there has not been a lot of lending on the asset side of the balance sheet. The behavior of the monetary aggregates was not expected and require going back to basics to find out what are the links between money, lending and economic activity. Portugal was cut two notches to A- with a negative outlook. Moody's and Fitch have not yet weighed in so it is likely we will have more bad news although the market impact will be less pronounced. While it was not surprising, the market reaction was swift. Greek bond spreads exploded higher and stocks got hit. The IMF also stated that Greece will need almost double what as expected just a few weeks ago. The most interesting point is that EM countries that needed IMF funds usually still had a either a default or a devaluation. The death spiral of rising spreads and needs for more funds almost always end poorly. The price on both the country or bondholders will be high. Interesting comment from Brown Brother's Win Thin who stated that Greek bond spreads are at the same level as before joining the Euro zone. The quality of credit has not changed after all of the benefits of having the Euro. Potato or .... what is the right name for China's currency? Renminbi is the name of China’s currency. Yuan is the unit in which prices are measured. This is similar to the distinction between sterling as the currency for the UK but prices are measured in pounds. There is nothing comparable in the EU, Japan or the US. No matter wwhat the wording, there still has not been any change in the dollar peg. If there is no talk how is the global imblance problem going to change. The "renminbi shopping fad" has caused shortages of Chinese yuan banknotes in Taiwan, a development that prompted local banks to become reluctant to sell the currency renminbi, with some even implementing a "buying only, no selling" strategy. There has usually been a nice relationship between the steepness of the yield curve and volatility. Call it a liquidity premium. Higher volatility was often associated with a steeper curve. When volatility declined or the liquidity premium declined, there would be a flattening of the yield curve. The relationship has not held up in the last year. Bond volatility has fallen off a cliff since the highs at the end of 2008, yet we have seen the yield curve get steeper and no decline in sight. So what is going on? There is not an inflation effect because price increases have been tame even with the recent increase in PPI. In fact, after an inflation expectation scare. The market seems to believe we will be in a benign inflation environment. A more likely scenario is a price pressure effect from government debt. The relationship between debt and the yield curve has been measured to be positive but slight. However, this was under pre-2008 conditions. The size of debt has been multiples larger. Yet, even this story has problems. Up until recently, the debt markets have not issued a significant amount of private deals so it is harder to argue for a crowding of private capital. The steep curve story will be one of the more important fixed income mysteries to be unraveled in 2010. Oil price shocks - should we brace for another one? All US recessions have been preceded by an oil price shock. This has been one of the strongest relationships we have concerning business cycles. Of course, all price shocks have not lead to recessions. The global recovery has begun so the demand for energy has increased. We are now having another price shock with oil hovering in the mid-$80's. Prices are significantly higher from the price bottom. Up over $40 dollar and almost double the lows, so what does this mean for the current recovery? Oil prices are determined in the global market so those economies which have been dong well should be able to weather the higher prices, but economies which have seen slower growth will see this price increase serve as a drag on economic performance. Gasoline prices have only increased about 15% so the impact of higher oil has not hit the consumer through their driving costs. This cannot usually be sustained but the controlled increase has blunted the oil shock. 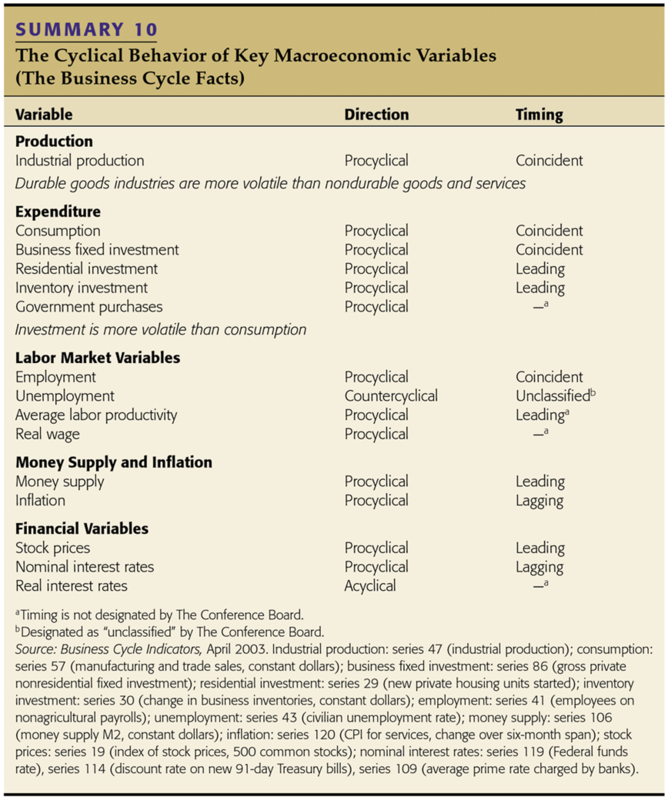 Business cycle dating - why the delay? The recession began in December 2007 . 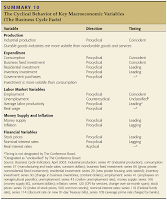 The NBER business cycle dating committee made this determination in December 2008. On April 12, a NBER press release stated that they reaffirmed to beginning of the recession but stated that they believed that it was too early to declare the trough in the business cycle. We know the committee wants to be certain of its opinion but the evidence seems strong and the committee clearly does not have a consensus that we are in a recession. For more on the dating procedures of the committee, see the NBER website. Some members of the committee already believe that the trough was hit in the second or third quarter of 2009. Jacob Frankel and Chairman Bob Hall fall in that camp. Robert Gordon of Northwestern has actually dissented with the committee and says that the recession clearly end in the second or at the latest third quarter of 2009. If the committee delays, do the markets care? They should not. Certainly the stock market is acting like we are in a recovery, but still there is important news when the non-biased NBER sets the trough in business cycle for discussions of new policy initiatives. Brazil, Russia, India, and China, (BRIC's), had their second economic summit in Brazil. The IBSA or India, Brazil and South Africa also meet separately in Brazil. They are four trillion dollar plus economies not part of the OECD and represent 40% of the world population. From a simple description coined by Goldman Sachs, the BRIC seems to want to find a common political ground for addressing economic issues. They are large, growing, and control a significant portion of all international reserves. They are a force that must be listened to, yet it is not clear what they want from the rest of the world. They do not have a lot in common. Two are authoritarian governments. Two are democracies. Two are very rich in commodities while two are large consumers. Three have growing populations while the fourth is shrinking. Yet, there seems to be a common bond or belief among them that the world economic order should not be ruled from Washington or any other capital in the G7. Additionally, their belief is that the G20 seems to be an unwieldy forum not weighted by economic might. So what will be the goals of this group? The results are still fuzzy. They will not discuss the elephant in the room of Chinese currency adjustments. They did discuss increasing trade and linking trade to local currencies; however, it is hard to see how some of this will occur given the currency adjustments that are necessary with the yuan. Chinese yuan - what is the amount of undervaluation? A close examination of the mis-valuation of the yuan across a number of models gives a wide range of numbers. Models have some values that say it is close to fair value and others which state the undervaluation is closer to forty percent. 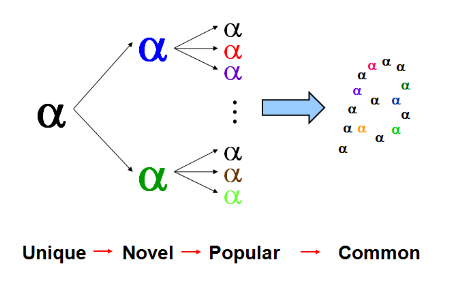 These differences are based on the type of model used or the data employed. For example, PPP estimates may differ based on what is the price index used. There can be strong cases that the undervaluation is above 20%. We prefer BEER/FEER models which show less undervaluation than PPP but there is still room for appreciation. The undervaluation does not change even with the news that the trade deficit turned negative in March. What is clear is that the central bank would not have to buy dollars and increase reserves if the currency was fair valued. A breakdown of the trade numbers shows a more complex exchange rate story. There is a trade surplus with the US and Europe but a trade deficit with the other parts of the world. Hence, the story concerning the impact of a change in yuan is more complex than what is seen on the surface. With the strong growth numbers, there is more room for an appreciation. without hurting domestic growth. An appreciation will also release some of the price pressure in the Chinese economy. Real GDP was up 11.9% for the first quarter, retail sales increased 18% and industrial production increased 18.1 percent. The issue has now become more political than economic. Still h direction toward a rising yuan is still in place. One item that doesn't fall into the it-could-be-worse department—see above—is the U.S. corporate income tax. It's already about as bad as can be. This year, American businesses may spend 89 cents preparing their taxes for every dollar they pay in taxes. In a new estimate, David Keating of the National Taxpayers Union estimates that the cost of compliance with the corporate tax is $159.4 billion—or 89% of expected tax collections for fiscal 2009, and 54% for 2008. European economic growth - Greek stall? Euro coincident economic index is showing stable levels after surging from the lows of last year. The European economies peaked in the first quarter of 2008. They were about three months behind the US. The US is moving ahead while the EU may be stabilizing. With uncertainty and poor growth in the high deficit countries, Europe may be following their usual slower growth trend. Fitch downgrades Greece - now what? We are down to BBB- from BBB+ with a negative outlook. Still there is uncertainty on what the EU will do to help Greece. Germany is willing to provide help but only at market rates. It is unusual that we have not even seen Greece go to below investment grade yet there is strong opposition to paying the market spread. You have to ask all of the below investment grade countries what they think about this situation. There is something absurd about the link between the action of ratings agencies, spreads and sovereign risk. The market is pricing in a hefty spread on these bonds relative to a year ago., but 400 bps is not out of sigh for a junk credit. Investors do not believe that Greece will make good on their plans. The rating agencies have been slow to react, so they are saying this is an investment grade credit. It is hard to argue that we are in a crisis if the ratings agencies cannot even come to the point of saying that Greece is below investment grade. Why should they get a discount? If you have to handicap this process, you should expect some bail-out at good rates and spread tightening. The yuan has been pegged to the dollar at around 6.83 per dollar since 2008, but the visit by Treasury secretary Geithner suggests that a deal may be in the offering to see an appreciation. 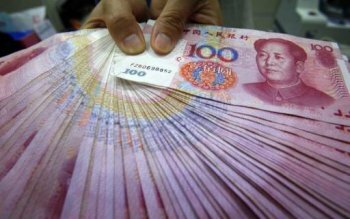 The Treasury will delay any report on calling China a currency manipulator so it seems likely that there will be some yuan change to ease the political pressure. This would be the deal. The forward point suggest a deal. The yen appreciation is another sign. Of course, economics can overtake the situation. China exports have declined for 13 months. This shrunk the trade surplus by 34 percent. This was expected since the US and the rest of the world was in a global trade recession, but it is harder to argue for an appreciation when trade is declining. Now we have a China trade deficit reported for March. The change in exports YOY was half of what occurred for imports. China reported a trade deficit. The internal politics in China makes it hard to have anything other then a token increase. He said a “sharp near-term reduction in our fiscal deficit is probably neither practical nor advisable,” but that a long-term plan for fiscal sustainability could help to lower interest rates and borrowing costs, and even stimulate economic growth. I heard Niall Ferguson give a talk in Boston the other week with an illuminating story. He argued that the current fiscal situation is like, "War financing without the war". Go back to WWII and you see massive increases in debt to GDP to finance the war effort. The impact was extraordinary and required the Fed to have an Accord with the Treasury to keep rates low. Unfortunately, we know what happens when war financing gets out of control, defaults and inflation. Chairman Bernanke may know realize that he is in a box. He cannot follow a normal monetary policy of raising rates given the size of the deficits. we usually expect a tightening within 6-9 months after employment starts to turn positive. Can we expect a tightening policy while the structural deficits are still rising? This will be a test of independence. a member of the Federal Reserve’s policy-making board challenged the notion that financial markets were self-correcting, saying that asset bubbles existed and that central banks could do more to prevent them. William C. Dudley, president and chief executive of the Federal Reserve Bank of New York, called on policy makers to more aggressively speak out against prevailing wisdom when asset prices fluctuated wildly. Comments like this make the Fed look like it will more closely follow the views of the ECB. Greenspan was never a fan of trying to prick asset bubbles. The same could be said of Chairman Bernanke. European central bankers have been more willing to look for bubbles; however, it is less clear that they did much with real estate excesses in Ireland or Spain. Dudley makes a strong case that even if bubbles are hard to identify this is not enough reason to do nothing. There are tools both monetary and regulatory which can be used to slow bubble growth. It takes a willingness to track markets and act if prices move from fundamentals. Unfortunately everyone knows about the bubble after the fact. It would be helpful if the Fed provides some working rules for how they assess valuation in markets. Evidence is growing that the recession is over. This is at odds with some recent Fed comments. which suggest that the low interest rate policy will last for the rest of the year. The exception to the recovery story has been in two areas, employment and housing, but even here patterns are falling into place which suggest we have turned a corner. The employment numbers have started to move positive, but the last two recessions have had very shallow recoveries especially with respect to job creation. This recessions seems to be following the same pattern. Take away the analysis of the poor employment picture which is a lagging indicator and the overall economic story looks like it is clearly improving. The housing area is also showing improvement with some areas actually producing price gains but this part of the economy has a long way to go before there are actual improvements in consumer wealth. An important story in the housing area is the fact that this it will not be a driver for future economic growth but this is a good thing. Do we need more housing in the country? Absolutely not. There can be a new balance in the economy that can lead to higher productivity and export growth. Nevertheless, new construction will be a drag on both growth and employment. One of the voters on the NBER recession dating committee is Jacob Frankel. He is clearly arguing that the recessions is over in his weblog. His two graphs above suggest that employment is following the pattern expected in a recovery and points to a recovery. However, there is a difference between saying the recession is over and that we have made up the output gap. It seems like many analysts are confusing the difference in an economic turn around and a reversal of the output gap. Andy Lo has presented an interesting visual picture on the development of alpha through time which is consistent with the efficiency theory of markets through time. There may be a unique way to generate returns outside of market exposure but as more firm uses that technique it only becomes novel. The profits from the process are diminished. As the technique becomes popular, profits are further diminished and the unique value is eliminated. There is less reason to pay a premium for these alpha generation services. Finally, the technique becomes well known or common and then represents a form of beta exposure. While I cannot always agree that this is a beta, a generalized technique cannot provide excess returns and should not receive a premium price for its generation. It is a beta in the sense that it is measurable and can be empirically tested. Think of the three factor Fama-French model. This alpha popularization could be what happened to the January effect that used to exist in many equity markets. The value was diminished when everyone used it in their investment scheme. The effect started earlier or did not show up in a year. The small firm effect has been diminished as more managers switched to equities outside the S&P 500 and measure the impact. Generating strong returns requires constant adaptation and development to stay ahead of the alpha popularization curve. Swaps spreads trading through government bonds is out of the ordinary, yet it is happening in both the UK and the US. Can government bonds be that risky? Unlikely. But there is a clear supply imbalance and the market is having a hard time digesting billions issued every week. 10-year - 3-month spreads are at extremes. This should be good news given the classic recession indicator of an inverted curve. A strong positive spread indicates good economic growth. The monetary policy is keeping the front-end rates low, but the longer-term extremes may again have to do with supply imbalances. "What everyone knows is not worth knowing." "The market will usually do what it needs to do to prove the majority wrong." "When one learns how to play the stock market game, they change the rules." There are two efficient market hypotheses. One is the bold, unsubstantiated proposition that financial markets are close to perfect and all-knowing. This theory was ferociously and convincingly attacked by Robert Shiller and Lawrence Summers three decades ago and quietly abandoned by its progenitors in the 1990s – although it lived on zombie-style in textbooks, central bank policy and some parts of the financial press until recently. When, these days, a pundit or government official rails against “efficient market theory”, this is what they mean. A second efficient market hypothesis, however, deservedly survived the financial crisis. It holds simply that it is very hard for any investor (or regulator, or journalist) consistently to outsmart the market. Evidence keeps pouring in to back up this “No Free Lunch” theory, as economist Richard Thaler dubbed it in these pages last year, even as its “Price is Right” counterpart has been shown wanting. Put another way, financial markets are perfectly competitive and most of the excess profits have been eliminated. The only way to generate extraordinary profits is to produce or generate a new system of returns. Once this system is known, extra profits will be eliminated and a new system has to be adopted.